For an angler on the move like Roach, power and cutting speed are not the only important considerations. Weight is important too. That’s why StrikeMaster augers are made lighter than their major competitors, often by a significant amount. This allows anglers to punch more holes, with less effort, while searching for that next hot school. 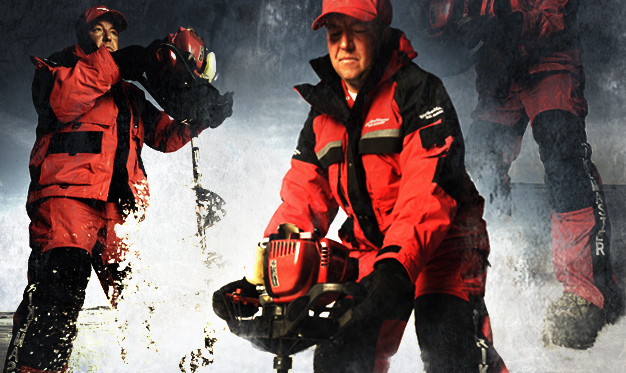 StrikeMaster has been building the highest quality ice augers and ice fishing equipment for more than 60 years. Where other companies will use lower-quality powerheads made in China, StrikeMaster uses German-engineered Solo motors on its 2-stroke augers and Honda motors on its new 4-stroke models. This entry was posted in Products and tagged StrikeMaster, Tony Roach. Bookmark the permalink.